Caratteristiche: Dopo la diraspatura e la pigiatura soffice, la macerazione è durata per ca. 1 settimana in serbatoi di acciaio inox. Durante questa fase, il vino ha completato la fermentazione alcoolica ad una temperatura non superiore ai 25°C. Il vino è stato quindi travasato e ha completato la fermentazione malolattica entro la fine di dicembre. Per un periodo di quattro mesi è stato poi affinato in parte nelle tradizionali botti di rovere ed in parte in serbatoi di acciaio inox. Ha fatto seguito la filtrazione del vino e l'imbottigliamento. Alcool : 12,5% Vol. La prima annata di Santa Cristina, il 1946, è stata introdotta dal Marchese Niccolò Antinori, padre di Piero Antinori. Colore rosso rubino; profumo intenso di frutta matura; al gusto ha buona struttura, è armonico, morbido e molto gradevole. "Wine Spectator" has rated the wine "Marchesi Antinori Santa Cristina Toscana IGT, Tuscany, Italy" from the vintage 2014 on 30.09.2016 with 84 of 100 points. "Wine Spectator" has rated the wine "Marchesi Antinori Santa Cristina Toscana IGT, Tuscany, Italy" from the vintage 2013 on 31.10.2015 with 87 of 100 points. "Wine Spectator" has rated the wine "Marchesi Antinori Santa Cristina Toscana IGT, Tuscany, Italy" from the vintage 2012 on 15.10.2014 with 86 of 100 points. "Wine Spectator" has rated the wine "Marchesi Antinori Santa Cristina Toscana IGT, Tuscany, Italy" from the vintage 2011 on 15.10.2013 with 88 of 100 points. "Wine Spectator" has rated the wine "Marchesi Antinori Santa Cristina Toscana IGT, Tuscany, Italy" from the vintage 2010 on 31.10.2012 with 88 of 100 points. "Wine Spectator" has rated the wine "Marchesi Antinori Santa Cristina Toscana IGT, Tuscany, Italy" from the vintage 2009 on 15.10.2011 with 86 of 100 points. "Wine Spectator" has rated the wine "Marchesi Antinori Santa Cristina Toscana IGT, Tuscany, Italy" from the vintage 2007 on 15.10.2009 with 85 of 100 points. "Wine Spectator" has rated the wine "Marchesi Antinori Santa Cristina Toscana IGT, Tuscany, Italy" from the vintage 2006 on 31.10.2007 with 85 of 100 points. "Wine Spectator" has rated the wine "Marchesi Antinori Santa Cristina Toscana IGT, Tuscany, Italy" from the vintage 2005 on 31.10.2006 with 85 of 100 points. "Wine Enthusiast" has rated the wine "Marchesi Antinori Santa Cristina Toscana IGT, Tuscany, Italy" from the vintage 2004 on 09.01.2006 with 86 of 100 points. "Bob Campbell" has rated the wine "Marchesi Antinori Santa Cristina Toscana IGT, Tuscany, Italy" from the vintage 2003 on 06.11.2005 with 85 of 100 points. "Wine Spectator" has rated the wine "Marchesi Antinori Santa Cristina Toscana IGT, Tuscany, Italy" from the vintage 2004 on 31.10.2005 with 85 of 100 points. "Wine Spectator" has rated the wine "Marchesi Antinori Santa Cristina Toscana IGT, Tuscany, Italy" from the vintage 2003 on 31.10.2004 with 84 of 100 points. "Bob Campbell" has rated the wine "Marchesi Antinori Santa Cristina Toscana IGT, Tuscany, Italy" from the vintage 2002 on 14.03.2004 with 85 of 100 points. "Wine Spectator" has rated the wine "Marchesi Antinori Santa Cristina Toscana IGT, Tuscany, Italy" from the vintage 2002 on 15.10.2003 with 83 of 100 points. "Wine Spectator" has rated the wine "Marchesi Antinori Santa Cristina Toscana IGT, Tuscany, Italy" from the vintage 2000 on 31.05.2003 with 84 of 100 points. "Wine Spectator" has rated the wine "Marchesi Antinori Santa Cristina Toscana IGT, Tuscany, Italy" from the vintage 2001 on 15.09.2002 with 83 of 100 points. 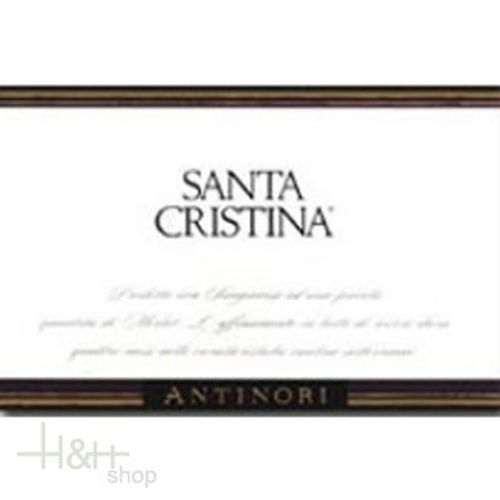 "Wine Enthusiast" has rated the wine "Marchesi Antinori Santa Cristina Toscana IGT, Tuscany, Italy" from the vintage 1999 on 09.01.2001 with 86 of 100 points. "Wine Spectator" has rated the wine "Marchesi Antinori Santa Cristina Toscana IGT, Tuscany, Italy" from the vintage 1999 on 31.10.2000 with 83 of 100 points. "Wine Spectator" has rated the wine "Marchesi Antinori Santa Cristina Toscana IGT, Tuscany, Italy" from the vintage 1998 on 31.10.1999 with 83 of 100 points. "Wine Spectator" has rated the wine "Marchesi Antinori Santa Cristina Toscana IGT, Tuscany, Italy" from the vintage 1997 on 15.12.1998 with 85 of 100 points. "Wine Spectator" has rated the wine "Marchesi Antinori Santa Cristina Toscana IGT, Tuscany, Italy" from the vintage 1995 on 31.10.1996 with 81 of 100 points. "Wine Spectator" has rated the wine "Marchesi Antinori Santa Cristina Toscana IGT, Tuscany, Italy" from the vintage 1993 on 28.02.1995 with 84 of 100 points.